Community activist Andrew Holmes attends a memorial for his daughter, Tamara Sword, gunned down in Indianapolis last week. 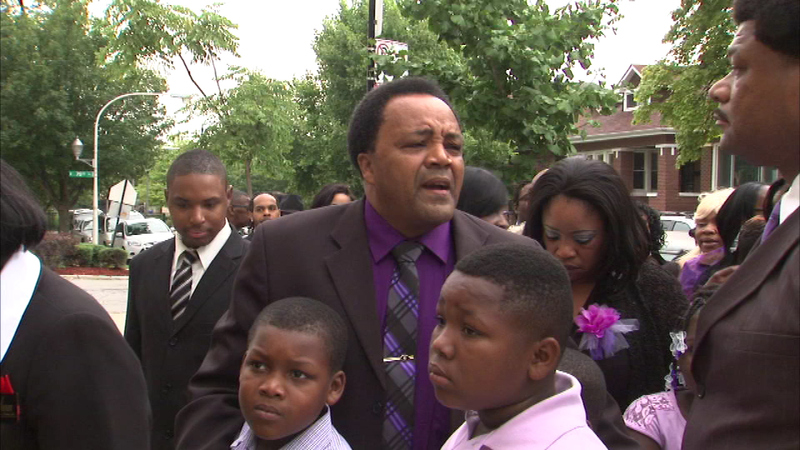 CHICAGO (WLS) -- Loved ones gathered Saturday morning in Chicago to remember Tamara Sword the daughter of anti-violence activist Andrew Holmes. Friends and family gathered at St. Sabina Catholic Church to say goodbye to the 32-year old mother of five. Sword lived in Indianapolis and was shot to death while trying to escape gunfire outside a night club. Other families touched by gun violence attended the memorial, including the parents of Haydiya Pendleton and Chicago police officer Thomas Wortham. Father Michael Pfleger of st. Sabina called violence an "epidemic." "As Americans we gotta stop ignoring it, stop pretending it's just going to go away," Fr. Pfleger said. "It's not just going to go away. We gotta make it go away." No one has been arrested for sword's murder. A $16,000 dollar reward is being offered in the case. Tamara Sword, daughter of community activist Andrew Holmes, pictured with her five children.